All orders will be shipped UPS. In the case of backorder, the entire order will be held until everything is ready to be shipped. Unless prior arrangments were made. Most orders Placed before 3pm EST Monday-Friday will be processed same day. All others are processed the next business day. Please locate your state below. 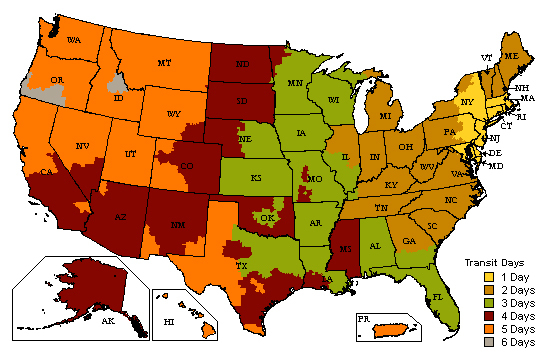 Match the color of your state to the chart located to the right of the map. The amount of days represents the amount of business days(weekends are not considered business days) that it will take for you to receive your order once shipped. (We are located in New York).